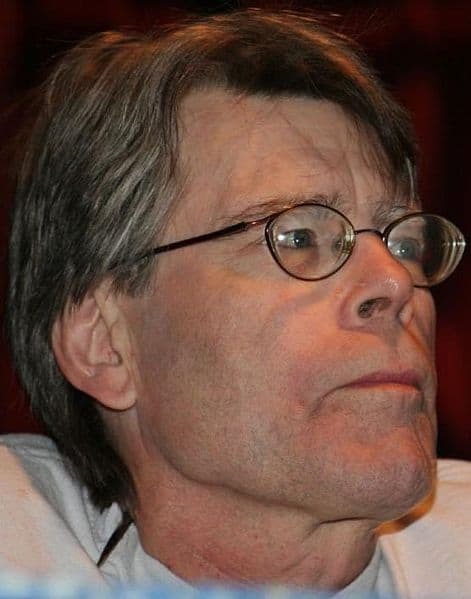 Image: Stephen King, 2007 by ‘Pinguino‘, free licence. A nice variation there. It must be a common theme among writers though to be anarchists when it comes to work. I certainly know that I’d rather be writing than working…so I tend to write when I AM at work. It’d be rude not to! I think many writers have started like that – David Gemmell put the finishing touches to Legend, his first novel, while at work. I can’t think of a more productive form of procrastination than that! Fantastic – that is good! I’m giggling over here! Well done! Love it. I can certainly attest to the one about doing things you’re not supposed to be doing…..
Fabulous grouping of quotes! I especially like Robert Frost’s words…I experience that every time I sit down to write! Robert Frost is my favorite on this list. That’s my feelings entirely. I second that – good old Frost! Most inspiring! I think Samuel Beckett’s is my favourite. This one is SO true!! I know because I am a hard worker, except that I am unemployed now. Having no job made me realize that my life is empty. Sorry to hear about your unemployment :( I agree that Wilde hit the nail on the head with that quotation! Really fun! Love the first one! Thanks! Very nice, found myself laughing at some of those. Good read. A few of them made me laugh. Robert Benchley’s qoute is simply marvelous! Agree about Benchley! And thanks, glad you liked the list! Well, each one of them is true word. Love it. Thank you. Robert Frost and I would be great pals. Great list of quotes! Reblogged this on Girl With Author-ity. I’m with Wilde on this but an entertaining and revealing list overall – many thanks. I know, they seem to have put it so well, much better than I ever could. That’s why I love compiling these posts! At first, I thought these great (and interesting) quotes from writers would be about writing. But they are generally about work, that is, work as something different from writing. Robert Frost’s quote captures my experience very well :) What about you? What quote resonates the most for you? What a wonderful set of quotations! As a writer I can attest that Benchley’s quote is absolutely right! The majority of these, especially those the first half, are apparently based on paradoxes in the ‘less is more’ mould. I think the authors with their witty asides are trying to preserve a sense of mystery for their art. Quotes keep me motivated to write. I wanted to say thanks for coming by my blog today. Much Appreciated. AWESOME! thanks for this – enjoyed it much! :) ~y. My pleasure – pleased you enjoyed it! Interesting Literature indeed…I always feel enriched after reading your posts…absolutely wonderful (and true too)! I especially love Robert Benchley’s quote. It is almost my life story at the moment. I recently wrote a post about writers and what makes them great: http://mybeautifullife96.wordpress.com/2014/02/20/beauty-of-great-writers/ (needless to say, it wasn’t what I was supposed to be doing at the moment). I love this! Trying to feel inspired to start my own photography business and this has really helped! If you’re going to do nothing, make it a brilliant nothing; then write about it later. Enjoyed these quotes, thank you! This cheers me up every time I read it. If you’ve ever had trouble getting to the work you really want to do, read this and know how very normal you are.